The Solution has the choice of 2 sails; a full cut and a flat cut. The difference between the two cuts is relatively subtle- both are the same area / size and at first glance look identical. 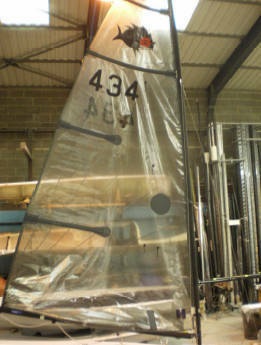 Both sails are produced by Hyde Sails and available through Ovington Boats. This provides a wider competitive weight range, yet still retains a strict one design, single supplier ethos. This keeps costs down and ensures a level playing field for all sailors. The Solution Class Association recommends sailors of below 72-74kg use the flat sail, while sailors above this weight may want to use a full sail. This is only a guideline and can vary with sailing style and typical conditions encountered (inland a lighter sailor could typically use a more powerful sail). The 2012 National Championship saw 3 full sails and 2 flat sails in the top 5 places. The class tuning guide is the same for both cuts of sail. The Solution was originally supplied with a ‘Redeye’ manufactured sail- these are easy to distinguish as they were made from a different sailcloth with a gold/ brown colour. There is nothing wrong with the cut of these sails, however they are relatively old, so check the condition when buying a used boat. It is easiest to measure the grid shown and use masking tape to mark squares for the numbers keeping the horizontal lines parallel to the batten below them. Spacing between all numbers should be 70mm. 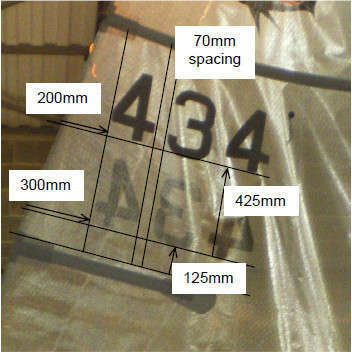 The sail numbers on the starboard side need to be above the port ones, as in the photo. 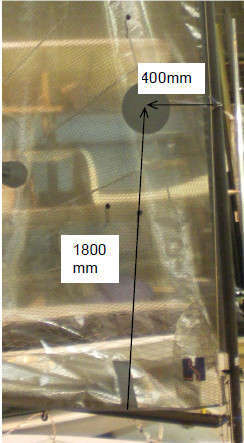 Measure 1800mm from the foot of the sail through the first tell tail, and 400mm from sail luff to the centre of the patch.